Take a break and relax this Saturday at SlotoCash Casino with 50 free spins on the Asgard slot and a 250% VIP bonus. 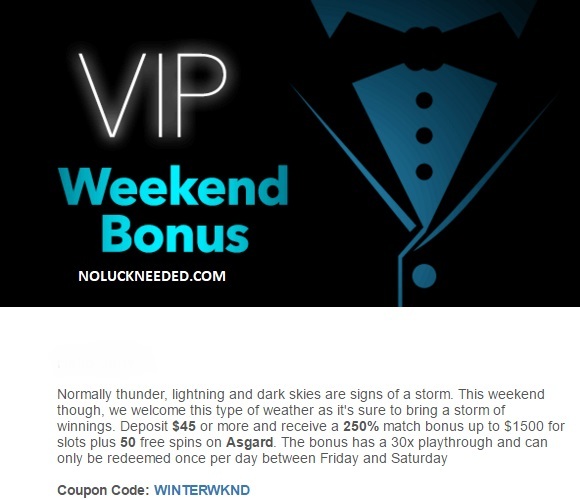 Redeem the bonus code WINTERWKND to claim your 250% match bonus with 50 added free spins if your account qualifies. You can also claim a $50 loyalty free chip with the coupon LOYALBAMBA after completing a deposit in February, but do not claim two free bonuses in a row. Good luck! $31 Free Chip for New Players: Register a new SlotoCash account after clicking the banner below and claim noluckneeded.com's exclusive $31 free chip by redeeming the no deposit bonus coupon "NLN31" in the casino cashier. Good luck! $40 minimum deposit. 30x wagering on slots. Can be redeemed once per day on Fridays or Saturdays. Start Date: December 15th, 2018. Duration: 60 days; Game: Cleopatra's Gold; Buy in $0. Starting Chips: 12,000. Add-ons $1; Prizes Top 43 Paid prizes of $20.19 to $201.90 * If you are not a real money depositor you may only cashout $180 once from any tournament winnings. Claim Your Asgard Free Spins and 250% Weekend Bonus at SlotoCash Casino!